Datamoshing is “the practice of intentionally using compression artifacts in digital video and animated GIFs to create glitch art”. INDIGO, the games expo put on by the Dutch Game Garden, was pretty intense this year. 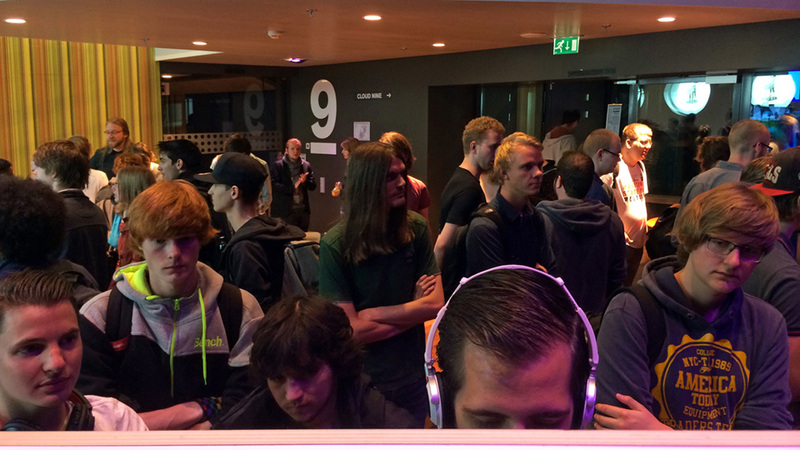 32 local devs gathered on the spaceous ninth floor of music palace TivoliVredenburg for two days to showcase their games in development. I was there too with Black Feather Forest. I saw some familiar faces, some fresh new ones, and talked to a ton of people. Seeing visitors take the time to play through the entire demo and most of them raving about it afterwards was a really great experience, and a much needed refreshment after the past few weeks. Thank you to everyone who came out and stopped by! My parents, uncle and some good friends included. Also dinner with my Game Oven friends was a good time, and my booth neighbours from Wolfdog Interactive kept me going through the long hours. And a special shout-out to Benjamin who came to help me out on friday evening after work when my legs had turned to jelly. You rock dude! It’s hard to describe all the moments and conversations from those two days, but I wanted to highlight a few that really stood out. As a kid I used to read Power Unlimited, the biggest games magazine in the Netherlands. Of course like any publication it’s run by normal people, but having looked up at these guys in my teens it felt pretty special to have them stand in front of my booth checking out my game and following me on twitter now. Check that off my bucket list. Speaking of nostalgia, the memories left behind by the game Broken Sword are what compelled me to start making my own games, and then all of a sudden I run into a programmer from Revolution Software, and a dutch one at that, on the show floor. It was really cool to meet Joost and exchange adventure gaming stories. Near the end of the VIP night on thursday an older man came up to me. He started on the demo as I explained what the game was about, then he turned to me and asked me why I cared so much about this particular true story. From there we got caught up in a passionate exchange of ideas, where he revealed that he was a recovered stock-broker-turned-drug-addict who just started learning about computers three days ago. After getting clean he had set out on a quest to learn about himself, and had become a very joie-de-vivre carpe-diem kind of guy. 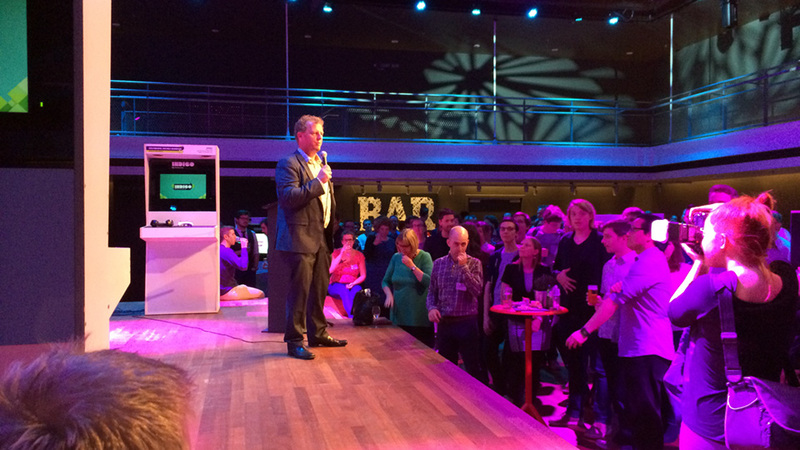 He wasn’t even on the guest list that night, he had just wandered in and was having a blast talking to people. We spoke for about half an hour and at the end shook each other’s hand with a well-meaning I haven’t experienced in a long time. Like we were both genuinely excited to see the other enjoying life, and wishing eachother well. The second day of the expo was also punctuated by an unexpected meeting. 5 minutes before the end of the show a man dressed in a priest’s garb came up to me. I recognized him as Roderick Vonhögen, also known as the podcast priest. He hadn’t played the demo yet but had read all about the project on my website before coming here and went on to tell me how incredibly cool he thought it was. He was even familiar with The Walking Dead games, which was perhaps even more of a surprise. It was super cool to have had a chance to talk with him before packing up and heading off, and I took his encouragement to do a Kickstarter and get on Steam to heart. I’d been on the fence about Kickstarter for a while, but after I left the hubbub of INDIGO behind that night and checked my email on the bus home I saw that perhaps a Kickstarter was not even going to be necessary…knock on wood. More info on that very exciting email soon. 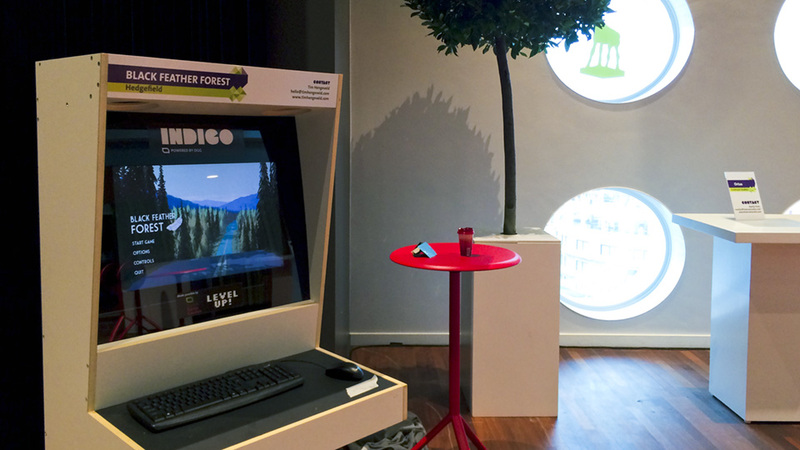 All in all INDIGO was a great succes and I want to thank the Dutch Game Garden for letting me be a part of it. It’s hard to fathom that it’s been a year since I started working for myself. Said goodbye to my desk job designing games for someone else (honestly it was a sweet job, what was I thinking) and started my own thing. I got some assignments pretty quickly, thanks mainly to friends/colleagues putting in a good word, and thus I started incing my way up. I’ve been able to carve out a pretty okay living so far, struggling some months when the work dries up for a bit, but enough to move up to a nice studio apartment with my girlfriend and pay the bills (and jump into a Steam Sale every now and again). And now, 52 weeks later, I announced my first solo commercial title! Holy cow I hadn’t even thought of that. When people asked me around week 45 what I was going to do for my ‘anniversary’ I shrugged. Turns out week 52 was pretty special after all, thanks to the fellas at Warpdoor. More on that in next week’s update. But for now I want to thank the fine folks that offered their support, good conversations, and/or advice this past year. Some names that come to mind: Jens, Michiel, Adriaan, Bojan, Benjamin, Ilona, Lowen, Anke, Alwin, Niels, Esther, mom and dad, Ralph, Anne, Matt, Chris, and ofcourse you, dear reader. Then, presskit! I am perhaps disproportionately excited to have this bit of php code, but if you as a journalist or what have you ever needed any info on my company or my games, the presskit’s the place to be. So now, back to the daily grind. Before HoT started getting picked up by the media I found myself mostly doing small tasks – a subconcious way to avoid having to deal with the large and nebulous tasks still in the backlog. However it wasn’t without its merits, the demo segments are a lot more polished now. “But,” I thought on tuesday, “what actual new content was added to the game? None!” So I got to it and started doing animations, and made a start on a new scene. Then over the weekend I went on a small vacation with friends, during which the social media coverage really fired up. Next week: tales of exciting new improvements to the interface, and great feedback on the demo from cool people. Today I want to talk a little more about something I touched on a few weeks ago, and I’m seeing it more and more now when I’m talking to people about their creativity. We can call it Imposter Syndrome. That is an actual clinical term, describing people who are ‘unable to internalize their accomplishments, despite external evidence of their competence.’ They remain convinced that they are frauds and do not deserve the success they have achieved. That sounds strange, but it is more common than you think. The first time I noticed it was when it was a running gag among cartoonists. We joked it was part of the job, and we didn’t really see it as a bad thing. It seemed like something everyone has to go through from time to time, this crippling fear about your work and career (especially if it is also your source of income). The idea was most clearly expressed by Scott Kurtz and Kris Straub in their daily podcast from way back in 2007 when they talked about being scared of the ‘Failure Police‘ – listen to the clip here. I always took solace in the idea, this shared burden that united us. But it wasn’t so much at the forefront of my thoughts until I heard Alec Baldwin’s interview with David Letterman on WYNC’s Here’s The Thing podcast earlier this year. Listen to the clip here, and tell me what you think that sounds like to you. I’m afraid that this was all an accident. I’m afraid I’m here for nothing. I’m afraid my show will fail. I’m afraid people hate who I really am. I’m afraid I hate who I really am. I’m scared I’ll never reach my potential. I’m scared that sounds pretentious. I got really lost. But I can’t be lonely, cause we’re all here. I don’t think it’s a bad thing per sé. It’s not a great thing, to feel like that as a human being, but I think eventually it helps you get better at what you do. And if you, right there, are someone who enjoyed the creative work of someone else, think about taking a minute or two to send them an email saying that. It means more than you think. I wasn’t going to write anything this week, since not a lot happened on the work side. I had other things on my mind. But I realized that that’s part of the job too. Especially when working on your own. If something affects you personally it affects your business. If I don’t feel like drawing for a few days (for a good reason and not because I’d want to play GTA), things come to a standstill. It happens. I’m glad I get the time to feel things and sit and think about things whenever I feel like I need to, and not just on bathroom breaks during crunchtime. It’s a scary thing when you lose your incentive to create art, even for a little while, so it’s important to know that it will come back. And I write this as much for myself as for you, the reader. I, like every other creator I’ve ever talked to about this, have my moments of self-doubt. We’ve come to accept it as part of the trade, and when it happens we give it space. But we cannot give in to it. We have to learn from it. Stephen Pressfield wrote an excellent book about this called The War of Art. Read it. Creativity comes from a very personal place. Everything you make, even things you don’t like or want to make, even if it is assets for a Zynga game, it has a little part of you in it. Who you are and what you experience in your life leads you to do what you do, and in turn it will tell you more about who you are. I’m convinced your best work only comes from listening to that urge. And how much you listen to that urge is up to you. I quit my job for it; you don’t have to be that drastic. When you experience something that stands counter to that urge, some hardship, something with an impact, it can mess you up. Some people find creativity in these things (I’ve never worked so hard as times when I was angry about something), and for other people it puts everything in perspective, and creating new worlds to explore and different lives to experience doesn’t seem as important as living their own. But don’t be scared of it. We all have these moments, and if you become aware of them, they will pass, and leave behind more experience to draw from. I can feel this one leaving too. Someone once related to me this quote. It captures quite well how I feel about creativity. I hope it resonates with you too.